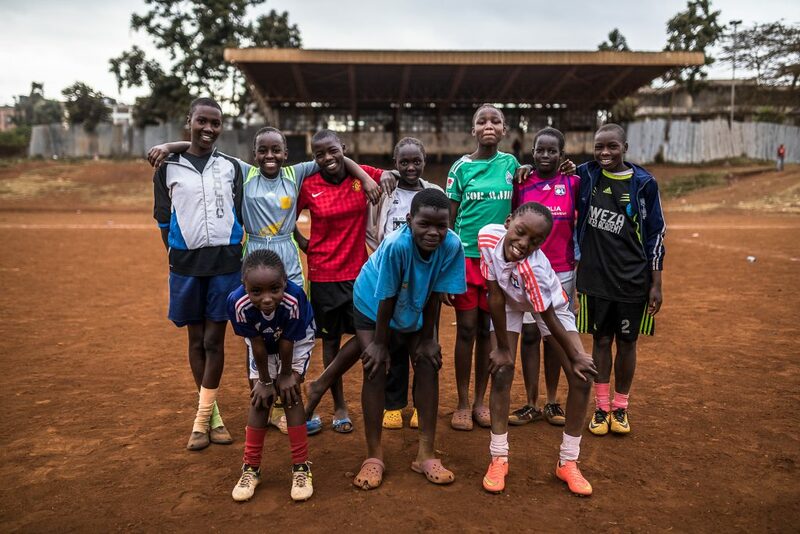 The Uweza Soccer Academy provides both boys and girls from the Kibera slum the opportunity to participate in coached training sessions as well as matches and tournaments with other youth from Kibera. Current Uweza teams include Boys Under-8, Under-10, Under-12, Under-14, Under-16 and senior and Girls Under-12, Under-16 and senior. The soccer academy was started with one team in August 2007 by a group of boys from a children’s home in Kibera that played soccer with with rubber-banded plastic bags every day in a small, cramped area outside of the center. A coach from Kibera began to hold weekly training sessions with the team. The team continued to train throughout the crisis that followed the 2007 Presidential Election and membership slowly began to grow. Today, the Uweza Soccer Academy includes over 130 players ages 5 to 25 who come from throughout the slum to play. We employ five coaches and rent a large field at a Kibera primary school for weekly training sessions. Both the boys and girls teams are well known in Kibera for their abilities and Uweza Soccer Academy is the only full-fledged soccer academy in Kibera that includes both men and women’s senior teams and boys and girls teams in all age categories. Follow Uweza Soccer Academy on Facebook for updates, match results, and more. Uweza FC (Uweza Men’s Senior Team): Since 2012, Uweza FC has participated in the Football Kenya Federation’s Nairobi County League. The team is composed of the academy’s oldest players, ages 16 to 25, who travel throughout Nairobi every weekend to play with other senior teams. Playing in the league keeps these players, who are at a particularly vulnerable age, occupied and away from unsafe activities. 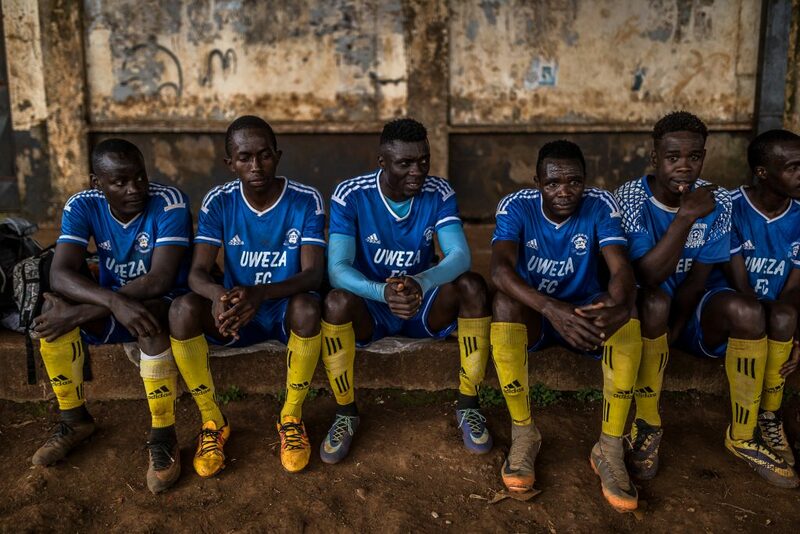 Uweza FC players have also started their own self-help group that engages in group savings and loans, joint business ventures, and community-service projects. 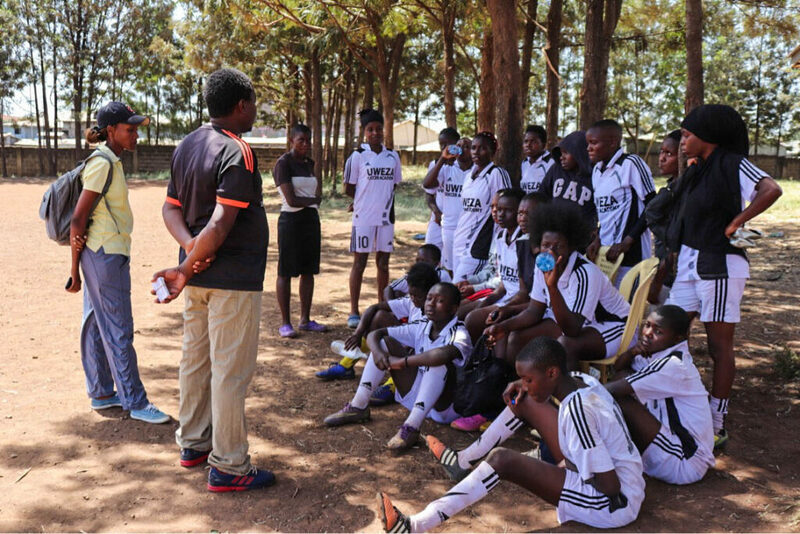 Uweza Women FC: The Uweza girls and women’s soccer teams train at the same time and in the same place as the boys teams and participate in tournaments and matches throughout Nairobi. The girls and women’s teams are led by a female coach and the girls’ participation not only builds their own self-esteem and confidence, it also challenges societal and cultural gender norms and contributes to achieving gender equality. Uweza Women FC is currently participating in Football Kenya Federation’s Nairobi Women’s Regional League. 1. Teams act as a support system: Being able to come to play every week gives the players a sense of regularity and stability in a living environment that can be chaotic. Coaches act as mentors for the players and liase with parents to ensure players’ overall well-being. 2. Skills building Participation in sport is known to help youth build skills such as honesty, respect, discipline, leadership, and teamwork. Uweza emphasizes the importance of these skills through a points system. Coaches award players with points at each training session. An award ceremony is held every term to recognize players for committment to the academy and skills gained. 3. Productive use of time Participating in soccer keeps players occupied in a safe and productive activity. Players are more likely to stay away from drugs, crime, and other negative behaviors that result from idleness in the slum. 4. Reducing tribalism The academy combats tribalism by combining players and coaches from many different ethnic and tribal backgrounds. 5. Educational support Players are encouraged to attend after-school tuition, provided by Uweza. Every term, all participating players are provided with school notebooks and pens. Winners of the skills-building points program receive additional education awards. Players are asked to submit report forms every term so coaches can follow up with academic progress. 6. Job and income generating opportunities: Older boys and girls players are able to earn money by providing assistance in running the program. Players wash their own jerseys, help referee and coach younger players, coordinate repairs of equipment, and do other small jobs for allowances. One academy player has been hired as a part-time employee and ten others have received free coaching training that will enable them to pursue job opportunities in the future.